Truck driving is already a dangerous job and a recent study has found that truckers with three or more medical conditions are up to four times more likely to be in a crash than those in good health. And while long hours on the road certainly make it more challenging to maintain a healthy routine, the industry is stepping up with more wellness programs and some dedicated drivers are creating their own fitness regimes right from their rigs. The University of Utah School of Medicine recently conducted a study examining the correlation between truck drivers’ health and their involvement in crashes. After comparing drivers’ medical records and crash histories, they found that drivers with at least three health conditions were more likely to have been involved in crashes that could have been avoided. They also found the average crash rate resulting in injury among all truck drivers was 29 crashes per 100 million miles traveled and that number increased to 93 crashes per 100 million miles traveled for drivers with three or more ailments. The investigators said these numbers held true even after considering other factors such as age and amount of commercial driving experience. The findings also revealed that one health condition such as diabetes is manageable but diabetes combined with high blood pressure and anxiety can significantly increase a driver’s risk. It was also found that of the medical records of 49,464 commercial truck drivers, 34 percent had signs of at least one of several medical conditions (such as heart disease, low back pain, and diabetes) that have previously been linked to poor driving performance. In 2014, another survey conducted by the National Institute for Occupational Safety and Health survey found that 69 percent of long-haul truck drivers were obese, which drastically increases the risk for several conditions including heart disease, diabetes, stroke and fatigue. Of course everyone knows that sitting for long hours behind the wheel, irregular sleeping patterns, and eating on the road are prime factors that would challenge anyone to maintain good health and rather than blaming truck drivers, several initiatives have been put in place to help them. Many companies now offer wellness programs for their employees, truck stop chains across the US are installing gyms, restaurants are offering healthier menu choices and in-cab workout systems are now available on the market as well. 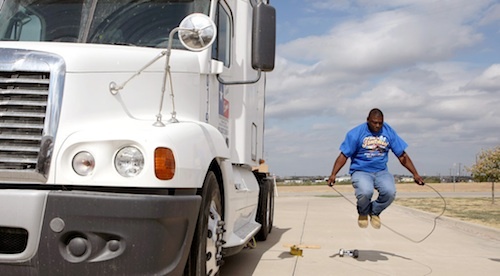 But truck driver, Rodney McCloud, recent winner of Prime's Fittest of the Fleet competition, says that anyone can get in shape from anywhere and it's a matter of being committed and creative. The 46-year-old weighs 222 pounds, has a 33-inch waist and 18 1/2-inch biceps from a regular workout routine that can be done anywhere he parks his rig. In addition to using the weight set he carries in his truck, McCloud's workout includes forearm slams against the side of his trailer, knee kicks to the tires, and prone pull-ups and dips on the side of his rig. "Since I started driving in 2008, I've seen only one or two other truckers working out in the lot like I do. People look at you funny, but I don't care. I work out in all kinds of weather, and when I'm waiting around at a shipper, I shadowbox, skip rope, or do pushups. You make it happen when you can," says McCloud. I do cardio and yoga behind my trailer , always park as far away from the food and store as I can so I have to work for it. Get fruit and veggies from the store. Trk stops offer very little. Have you ever figured that part of that smell isn't coming from the humans, but the trucks instead? After all what does DEF smell like, and where does it come from? But Victor, the VAST MAJORITY of the smell comes from the human urine covering the lot. I don't think so, being I have been around trucking all my life, and drivers could and did piss anywhere one needed to, and it wasn't ever like it is now. So please explain how you figure most of it from the humans? That may be true... U can always take walks around the truck stops.. I do... Sometimes is tough but better than nothing...be well. I was about to say push ups in piss no thanks. I carry two 25 pound dumb bells I work with and try to walk a decent pace 30 min a day. Just that little bit helps me. Victor shits in the parking lot. I stopped drinking sodas completely and eating while the truck is in motion. Cut way back on the amount of sugar I was eating at night. I have lost 30lbs in 6months. Where do these drivers come from? Exercise, drop and hook, gps, email, paperless logs, automatic transmission, only 300 miles a day, no night driving, what a great job they have. I'm 64 years old, been driving for 8 years, retired oil field. I'm usually off weekends and I've wogged ( walk/jogg ) in 5ks. So yes staying in shape can be done if you're serious about it. I stretch every 250 mile an walk around for 15 min. Or at least I try most of the time. An park so I have to walk a lot when at truck stops. I am not a truck driver but I am a daughter of one! I respect all you drivers out there! I have a great health and wellness company and we have a great nutrition line and even products that are great to help you sleep and for sore muscles, all the products are natural!! Company is called Arbonne you can check out my website cherylrooymans.arbonne.com or email me at rooymans79@gmail.com Stay safe out there and keep on trucking! Buy a yoga mat and do push-ups and sit-ups on it. Walk or jog while you're waiting at delivery or pickup points. Stay away from truck stop fast food joints. You'll be amazed at the difference! In 2012 I lost 50lbs just by walking. I changed my diet a little bit by eating more fiber than junk. Carrots became my junk food. I know when I pulled into a truckstop to park, i always went towards the back lot so I could get more walking excersise in! My husband carries kettle bells, does western martial arts and eastern martial arts workouts almost every day and he's 69 years young. Great idea. Get your head run over and squashed like a melon. Become a flatbed trucker! Securing and tapping freight is a hell of a workout! Always have a bottle of aspirin. Take one every few days to prevent blood clots. Why not exercise on a truck stop toilet? Same thing. I used to do that ok! !